Klopfenstein's Spectrum Steel Taboret was designed especially for classroom or studio use. 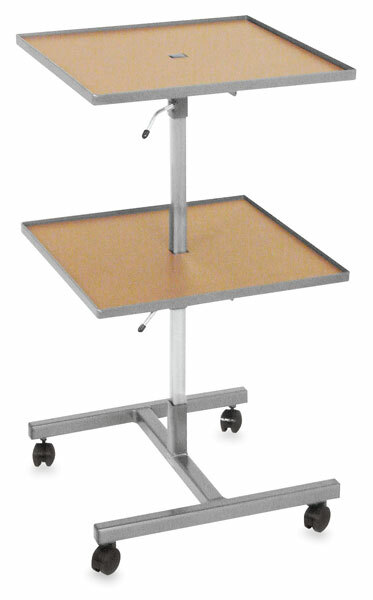 Its unique open design and adjustable shelving puts supplies at your fingertips. The four 2" casters make it instantly accessible wherever you are. A heavy steel frame supports two 18" × 18" adjustable shelves. Each shelf has a 3/8" high lip that keeps materials and supplies from sliding off. The upper shelf adjusts up to 34" H. The lower shelf adjusts from 11" to 29", and locks in place with a slight turn of a handle. Adjusts from 11" to 29" Adjusts up to 34" 18"